This East Van gem is a design-lover's dream. Located in the coveted Social building, the first things you'll notice about this 2 bed+den beauty are the huge floor-to-ceiling windows that flood the space in natural light, the open concept layout, and contemporary finishes throughout. The gorgeous kitchen features sleek wood cabinetry, polished concrete flooring, an oversized SS fridge, stone countertops, and a spacious island with breakfast bar. 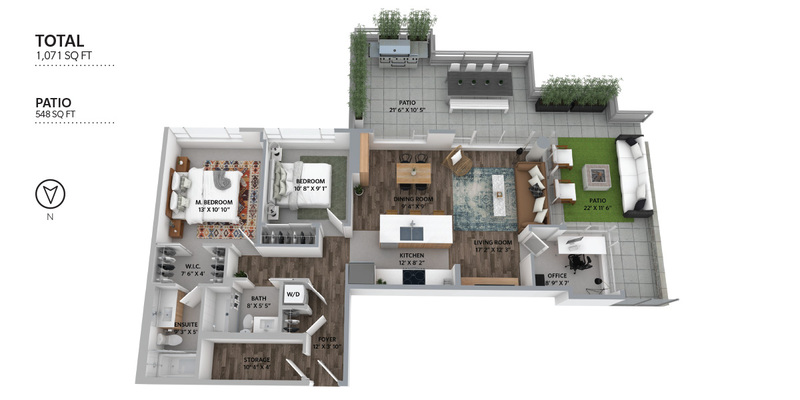 The living and dining areas feature gorgeous hardwood flooring, and look out onto your huge 548 sq ft private patio. You can sit back and relax while sipping your morning coffee under the custom wood pergola, enjoy dinner outside in the late evening sun, cozy up around the fire pit, or fire up the grill come BBQ season. Carefully manicured landscaping provides both greenery and privacy. Both bedrooms featured polished concrete flooring and overhead industrial-inspired lighting.The master bedroom features a generous walk-in closet, as well as a sleek and minimalist ensuite guaranteed to help you find your zen. And we haven't even started on the location! We might be biased, but we think that Mt. Pleasant is one of the best 'hoods in the city. Ten minutes on foot will take you to all the craft breweries your heart could desire, the Mt. Pleasant Community Centre, and some of the best food, fun, and shopping the city has to offer on Main St. We're smitten with this East Van beauty, and we think that you will be too. when additional listings are available in this building. You will be notified by email when the Social building has future listings. Your email address will not be used for any promotional purposes. This is only a reminder service.